I was surprised to find this an interesting and engaging story. I wasn't sure I could be onboard with people using magical balloons to escape Soviet oppression in East Berlin but, not only was I onboard, I couldn't put it down. The element of time travel always gets me, but there was a lot more to this novel. 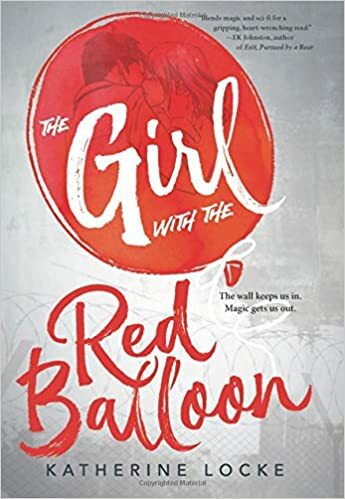 Ellie is a teenager, visiting Berlin on a school trip when she sees a red balloon floating nearby. Touching the balloon she travels back to East Berlin in 1988. She becomes involved with an underground guild that uses magic (and balloons) to transport people over the Berlin wall to freedom - but they cannot figure out how Ellie got there or how to send her home. When more time travelers are found dead in the streets of Berlin, it becomes clear that someone is trying to use the balloon magic to change history, but who? Why you picked it up: The Girl with the Red Balloon was the featured title for Overdrive's The Big Library Read in October. To be honest, I was between books and decided to download it because it was available. Why you finished it: This story had it all - time travel, magic realism, mystery, romance, history. I was surprised by how much I learned about East Germany after WWII, the Romani (gypsies) in Europe, the Holocaust and so much more. I was 30 when the Berlin wall came down in 1989, so this was not history for me, and I knew that people were literally dying trying to escape East Berlin, but this story just brought it all to life for me. In a story about a depressing period of history, this story was all about hope. Who you would recommend it to: It is billed as a YA book, so people that like YA, historical fiction, time travel and fantasy, mystery, magic... you should read it.